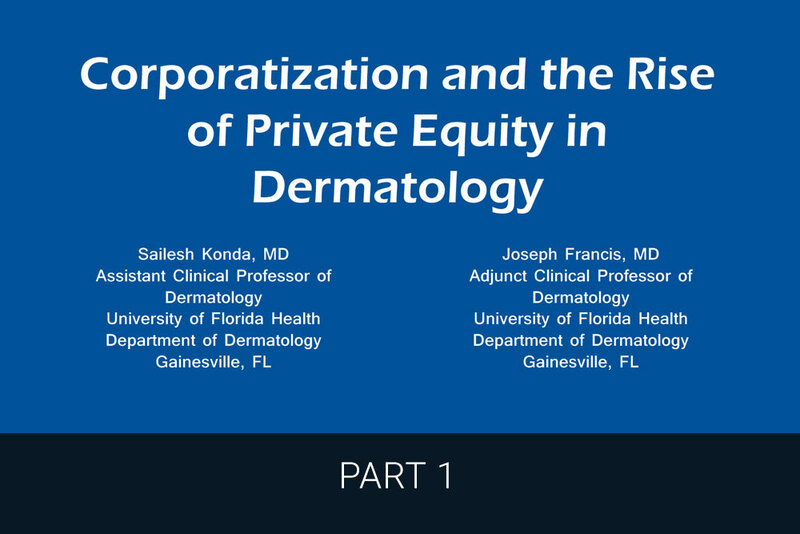 Private equity (PE) is one of the hottest topics in dermatology right now. I knew nothing about PE during my residency and fellowship training. I entertained the possibility of working for a PE-backed group after my fellowship training and even shortly thereafter. However, after talking to many colleagues, I saw the light and walked away from the PE-backed model. I became fascinated with PE and began researching its landscape and potential long-term impact on our specialty. Dr. Joseph Francis had been analyzing CMS data since it was first released in 2014 and was looking into outliers and the ethics of corporate dermatology. We decided to join forces and ultimately developed a cohesive talk. Our initial findings were presented to our residents and faculty during a Grand Rounds at the University of Florida in December 2017. The lecture was well received and has been given in a variety of local, regional, and national settings over the course of the last year. 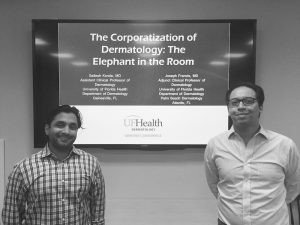 We also formed the Group for Research of Corporatization and Private Equity in Dermatology and recently published an article in the Journal of the American Academy of Dermatology on the subject, which was featured in the New York Times. As time is the limiting factor in sharing our knowledge, I am pleased to publish my first delivery in a 2-part series, offering our perspectives on PE to residents and early career dermatologists reading Next Steps in Derm. As of November 2018, there are 33 known PE-backed dermatology groups, two of which are now defunct. Twenty-five of these 33 PE-backed groups were newly formed or acquired in 2015 or thereafter. These PE partnerships are often via practice management agreements. This allows them to circumvent the AMA Corporate Practice of Medicine Doctrine and any corresponding state laws. Interestingly, the largest dermatology management companies, many of which are PE-backed, formed a coalition called the Dermatology Practice Support Alliance in May 2016. These coalition companies collectively own a majority of the corporate dermatology market. Herein, I will highlight five out of ten concerns about PE-backed models. Bain & Company summarized the ultimate goal of PE: “All PE firms want to create value as quickly as possible – to grow revenue and take out cost – and a strong playbook helps to accomplish that.” PE firms typically have steep fees – they take up to 2% of the assets under management and 20% of profits above the “hurdle rate,” which is the expected return for investors. Always remember the difference between a profession and an occupation. Non-physician managers in corporate dermatology groups may have significant responsibility and authority over physicians. There are reports of non-physician managers dictating patient care. Dermatology is a profession – not an occupation. PE-backed dermatology groups may employ physician extenders on a larger scale given their lower compensations compared to dermatologists. Physician extenders may be leveraged to the maximum extent allowable by state law with varying degrees of supervision. The New York Times article from November 2017 and the recent MarketWatch article from June 2018 offer a glimpse into the future of dermatology if PE firms with specific financial timelines continue to infiltrate our field and compromise our Hippocratic oaths. In response to growing concerns, the AMA passed a resolution in June 2018 to examine the effects on the healthcare marketplace of corporate investors, including PE firms. MarketWatch: Medical Practices Have Become a Hot Investment – Are Profits Being Put Ahead of Patients? PE has a history of boom-bubble-bust cycles across all industries since the 1980s. Despite touting theoretical economies of scale, many practice management companies failed overnight in the 1990s. PE is experiencing another boom because the stock market appears overvalued, hedge-funds are offering mixed results, and interest rates are low. Furthermore, PE has one trillion dollars awaiting investment, which may lead to practice overvaluations. Check out part 2, highlight the remaining 5 concerns about PE-backed models and offer my final thoughts on how to prevent PE-backed consolidation. The information presented and opinions expressed in this article are the author’s own and do not reflect the view of Next Steps in Derm. Did you enjoy this post? Find more on Starting & Running a Practice here. Next Steps in Derm is a virtual mentor for dermatology residents and young physicians seeking dermatology updates, advice on practice management and building their careers. Get advice from experienced physicians in dermatology. Next Steps is part of the SanovaWorks network. Got Board Exam Questions? Derm In-Review Faculty Has Answers! Help us bring quality mentoring resources to a growing audience of dermatology residents and young physicians. Get your free copy of the Next Steps in Derm Guide, the expert’s guide to post-residency career choices and practice management advice from experienced physicians. Read our quarterly publication featuring the most popular articles from the Next Steps in Derm online resource center and exclusive new content from experts in the field. Next Steps in Derm is a virtual mentor for dermatology residents and young physicians seeking advice on practice management and building their careers. Get advice from experienced physicians in dermatology. © 2013-2019 Journal of Drugs in Dermatology. All Rights Reserved.